Lindsey Beckley: Thanksgiving night, November 25, 1915. Fifteen men climb Stone Mountain in Georgia. Once at the peak, the men, led by William Joseph Smith, hoist and burn a wooden cross. With this act, the Knights of the Ku Klux Klan is reborn. Smith had been inspired to resurrect the reconstruction era fraternal order after watching D.W. Griffith’s film The Birth of a Nation, which romanticized the Klan as a heroic force. Five years later, the Invisible Empire reached Indiana. 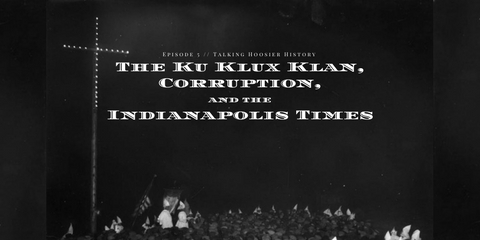 In this episode of Talking Hoosier History, we’ll discuss the effects and influences the KKK had on the Hoosier State. Hello and welcome to Talking Hoosier History, brought to you by the Indiana Historical Bureau. For over a century, we’ve been marking Hoosier History. Now, it’s time to start Talking Hoosier History. I’m your host, Lindsey Beckley. The phrase “Knights of the Ku Klux Klan” often conjures up the image of a vicious, mysterious, secret group riding through the countryside in the moonlight to hold meetings in the dead of night. A group of hooded and robed figures, carrying a whip or club or, more frightening still, a hangman’s noose. While these images may be accurate for the Klan of reconstruction era America, the Klansmen of the 1920s were a different breed. Beckley: That’s not to say that the Klan of the 1920s was any less frightening than that of the 1860s. For one, it was no longer a poorly organized fraternity isolated in the antebellum south. The second wave Klan was a multi-level organization, a national fraternal order with recruiters in all parts of America. The net of hatred they cast was wider, too. While their forbearers had focused their bigotry towards the newly free African Americans, the new iteration broadened their animus to include immigrants, political radicals, feminists, intellectuals, gamblers, bootleggers, Asian Americans, Jews, Catholics and any group they deemed to be “un American.” And while the reborn Klan wasn’t as overtly violent as their ancestors, they certainly weren’t above using violence and intimidation to get their point across. While the South had been the stronghold of the 1860s Ku Klux Klan the American Midwest contained the most fertile soil for the Klan of the early 20th century. The KKK came to Indiana through the Ohio River town of Evansville in the fall of 1920. While it started out as little more than a curiosity, Evansville Klan No. 1 would grow to have a membership of more than 5,000 members-or 22 percent of all native white males in the county within just a few short years. That incredible surge in membership was not isolated to Vanderburgh County, though. More than 250,000 men eventually joined the Klan in Indiana. As astounding as that number is, it doesn’t even include the members of their auxiliary group, Women of the Ku Klux Klan, or of their children’s organization, the Junior Klan. Beckley: The phenomenal expansion of the Klan in Indiana is often credited to one man in particular; David Curtis Stephenson, more commonly known as D.C. Stephenson. A travelling salesman, arrived in Evansville the same year as the Klan, 1920. Beckley: By 1921 he had joined the Klan and was making great strides in expanding the local membership. He soon moved to Indianapolis and opened a Klan recruitment office. There, too, he met success; in late 1922, he reported to have recruited 2264 new members in just one week. After backing Hiram Evans when Evans successfully overthrew William Smith for the highest office of the KKK nationally, Stephenson became the Grand Dragon of Indiana, the highest office in the state. Stephenson had high hopes for the Klan, both politically and otherwise. Soon after Stephenson being named Grand Dragon, the Indiana Klan entered into talks with Valparaiso University in hopes of buying out the floundering school and creating a “Ku Klux Kollege”. And yes, that’s “Kollege” with a K. While the talks ultimately failed, this episode demonstrates the all-encompassing ambitions of the Klan in the 1920s. Soon after that deal fell through, Stephenson and Evans, the new Imperial Wizard had a falling out over ideology and Stephenson split from the National Klan, taking much of Indiana’s membership with him to form a new independent Indiana Klan. In the midst of this upheaval, Stephenson set about shaping his Klan into the true Invisible Empire of Indiana government. Although there were no state-wide elections in 1923, Stephenson started fine tuning the Klan’s political machine in local elections across the state, hoping to be prepared for the upcoming gubernatorial primaries. By jumping party lines and backing individual “sympathetic” candidates, the Klan was able to influence several local elections. It seemed like Stephenson’s machine had done its job. Beckley: In 1923, the Chicago based anti-Klan newspaper Tolerance began publishing Klan membership lists from around the country. One name in particular caught the eye of the Indianapolis Newspaper, the Indianapolis Times, which ran a story titled “‘Tolerance’ Says Ed Jackson is Member of Klan.” Jackson, Indiana’s secretary of state, had reportedly received a telegraph giving instructions in regards to a vacant political position that had been signed “Old Man.” The mysterious ‘Old man’ was none other than D.C. Stephenson, who had formed a close relationship with Jackson, often taking the Secretary of State yachting. This was the first of many stories the Times published featuring Jackson and the ‘Old Man’ in the following years but before we get to that, let’s pause for a quick break. If you’re listening to this, you probably love Indiana history just as much as we do. Can’t get enough? Check out our blog, Blogging Hoosier History for compelling, informative posts covering a wide range of topics read about Indiana’s daredevil racer, Cannonball Baker, the Lincoln Funeral Train in Indiana, and the effects which WWI and the 1917 flu pandemic had on Indiana athletics all in one place. Find those posts and more at blog.history.in.gov. Now, back to the show. Voice actor reading from the Indianapolis Times: No Secret Order Shall Rule Indiana! A vote for Jackson is a vote for the Invisible Empire. Beckley: And just two days later, the front page of the paper read: Voice actor Voice actor reading from the Indianapolis Times: CHOOSE…Secrecy. Suspicion. Hate. Racial Bitterness. Religious Intolerance. Neighbor against Neighbor. Old Friendships Broken. Invisible Empire. The Mask. Herrin. Miles. Super-Government…OR…Government of the People, for the People, and by the People. Democracy. Peace. WHICH? DECIDE TUESDAY. VOTE. Voice actor reading from the Indianapolis Times: The time is now when we must mobilize and perfect the necessary machinery for the purpose of voting all our people and for the purpose of influencing white Protestant voters to vote for the Republican ticket; National, State and county, whom we know to be favorable to our cause, principle and program. Beckley: The causes, principles, and programs to which those politicians had pledged themselves included limiting foreign immigration, the supremacy of the white race, the segregation of African Americans, especially in schools, and the appointment of only Klansmen, Klanswomen, or “sympathizers” to any public position. Despite the Times’ declaration that “No Secret Order Shall Rule Indiana!” Ed Jackson won the election, a great success for Stephenson. He had very little time to influence the new governor’s policies, though. On April 14, 1924, just 4 months into Jackson’s term, Stephenson was arrested for the kidnap and murder of Madge Oberholtzer, a 29 year old Irvington woman whom he had met at Jackson’s inauguration party. Beckley: Oberholtzer, who managed the Indiana Young People’s Reading Circle, had been helping Stephenson write and sell a book when he drunkenly lured her to his home, kidnapped and assaulted her, then waited until she was at deaths door two days later to return her to her home for medical treatment. Stephenson was convicted of his crimes and sentenced to life imprisonment on November 16, 1925. Voice actor reading from the Indianapolis Times: Revelation of a gigantic super government within the State of Indiana over which David C. Stephenson at the zenith of his power as grand dragon of the Hoosier Ku Klux Klan held sway was promised today by Thomas Adams of Vincennes, head of a probe committee of the Indiana Republican Editorial Association. Those “revelations” were coming directly from D.C. Stephenson who, after a year of waiting, had given up his hopes for a pardon and was exacting his revenge on Jackson. Voice actor reading from D.C. Stephenson: What D.C. Stephenson, now serving a life sentence in Indiana State Prison, could tell the taxpayers of Indiana about graft in public office would fill a rather large library with interesting data…He could tell who furnished $120,000 in the campaign of 1924 and what interest was to be protected…He could explain how favorable political decisions were induced from certain courts…He could explain why certain men were placed in public positions from which there is an enormous profit, and he could tell who gets a fifty-fifty cut in the money…Briefly stated, if D.C. Stephenson could and would talk his knowledge of dishonesty in public affairs would create a State Scandal. Voice actor reading from Jackson: Governor Ed Jackson today filed a written denial to charges that he has property belonging to D.C. Stephenson…The Governor declares he holds no money, property or credits of Stephenson’s and is in no way indebted to him. Voice actor reading from Stephenson: I have been double-crossed for the last time and I am ready to talk. You can tell Prosecutor Remy of Marion County that I have numerous things that I am prepared to talk about freely and they are matters which I believe will start a much needed cleanup in Indiana politics. Beckley: And talk freely he did. After hearing his tale, one deputy said “the story told by Stephenson was most amazing.” The convicted ex-grand dragon told of documents he had in his possession which would corroborate his statements and for the next few days, the pages of the Times were crammed with updates on the efforts of authorities to find those documents. On July 9, the Times was still reporting that the authorities were searching for Stephenson’s so called “Black Box” of documents. By July 11, however, the story had changed. Voice actor reading from Stephenson: This check is the first one-fourth of ten thousand dollars given Jackson personally for primary expense. Voice actor reading from Ed Jackson: I want to state to the public that the check for $2,500 given to me by D.C. Stephenson was in payment for a very valuable saddle horse and equipment, a legitimate business transaction. Beckley: When asked if he still had the horse for evidence of the transaction, he claimed that the horse had choked to death on a corn cob. He would make no other statements regarding any of the other documents which the Times released. Jackson’s dealings with the Klan weren’t the only shady spots in his political past. On July 25, 1927, the Times ran a story accusing Ed Jackson of offering former governor Warren McCray $10,000 to influence his appointment for prosecuting attorney in 1923. Jackson denied the charges. The Times reported on July 25 that they had turned over Stephenson’s “Black Box” to the Marion County grand jury for examination. As a result, the Marion County Grand Jury indicted Governor Jackson on charges of bribery in September. At the trial in early 1928, former Governor McCray testified that the accusations made by the Times were truthful; Jackson and his associates had indeed offered him a bribe of $10,000 as well as immunity from charges pending against McCray in exchange for his nominating a prosecuting attorney of Jackson’s choosing. The consensus, both in the newspaper headlines and the courtroom, was that the Governor was guilty. Unfortunately, the statute of limitations had passed, preventing Judge Charles McCabe from passing down a guilty verdict. Despite calls for his resignation from all around the state, Governor Jackson refused and served out the remainder of his term, albeit with a dark cloud hanging over his head. While the Times’ crusade against the governor fell short of their ultimate goal, they were more successful in weeding out corruption in the Indianapolis City Government. Voice actor reading from the Indianapolis Times: the first duty of a newspaper is to print the facts about that institution in which all are interested most, the government itself. Voice actor reading from the Indianapolis Times fading in: prosecuting the guilty and bringing about a more wholesome state of affairs in civil government. Beckley: The downfall of the Ku Klux Klan in Indiana began when D.C. Stephenson split from the National organization, fracturing the foundation of the Indiana Klan. Their downward spiral continued when D.C. Stephenson, leader of this organization which claimed to promote Protestantism, morality, and prohibition, was arrested for drunkenly assaulting and ultimately causing the death of Madge Oberholtzer. Finally, the Knights of the Ku Klux Klan lost any remaining political power in the state when the officials who had been corrupted by their influence had been exposed by the Indianapolis Times. Beckley: Once again, I’m Lindsey Beckley and this has been Talking Hoosier History. If you’re interested in learning more about this topic, visit IN.gov/history to view IHB marker manager Casey Pfeiffer’s research for the Indiana State Historical Marker on this topic. As always, a big thanks goes to sound engineer Jill Weiss and Justin Clark, the voice of newspapers here on the podcast. A special thanks this episode goes to Indiana Historical Bureau Director Chandler Lighty who voiced D.C. Stephenson. Find us on Facebook at Talking Hoosier History and on twitter at @TalkHoosierHist, that’s H I S T. And finally, please subscribe, rate, and review Talking Hoosier History wherever you get your podcasts! Thanks for listening! Scharlott, Bradford. The Hoosier Newsman and the Hooded Order: Indiana Press Reaction to the Ku Klux Klan in the 1920s. Bloomington: Indiana University Press, 1978. Lutholtz, M. William. Grand Dragon, D.C. Stephenson and the Ku Klux Klan in Indiana. West Lafayette: Purdue University Press, 1991. Moore, Leonard. Citizen Klansmen, The Ku Klux Klan in Indiana, 1921-1928. Chapel Hill: University of North Carolina Press, 1991. Pegram, Thomas. One Hundred Percent American. Chicago: Ivan R. Dee, 2011. McVeigh, Rory. “Structural Incentives for Conservative Mobilization: Power Devaluation and the Rise of the Ku Klux Klan, 1915-1925.” Social Forces, 77, no. 4 (Jun. 1999): 1461-1496. Smith, Ron. “The Klan’s Retribution Against an Indiana Editor: A Reconsideration.” Indiana Magazine of History, 106, Issue 4: 381-400. Taylor, Stephen, “KU KLUX U: HOW THE KLAN ALMOST BOUGHT A UNIVERSITY” accessed Hoosier State Chronicles, Indiana State Library. The Indianapolis Times Marker File, Accessed Indiana Historical Bureau. As the Director of the Indiana Historical Bureau, Chandler makes Talking Hoosier History possible. Up until now, he’s stayed behind the scenes but in this episode he made his voice acting debut as the voice of D.C. Stephenson. Thank you, Chandler, for joining us in the recording studio! Jill is the sound engineer for Talking Hoosier History. She also assures Lindsey throughout the recording process that she’s not doing any worse than usual and she can salvage at least one good take from all of those many many bad takes. Justin is a project assistant with the Hoosier State Chronicles newspaper digitization project. In this episode, he played the parts of newspaper announcer and Ed Jackson. If you’re interested in reading historical newspaper articles, visit Hoosier State Chronicles online. Information on “Mystic City” accessed: Valerie Rogotzke “Songs of the KKK,” Lesson Plan. This quartet called themselves the 100% Americans. The recording uses a quartet and soloist for the choruses and verses, and is accompanied by a small orchestra with brass instruments. A grand and noble wizard who once had a wondrous dream. To affix and plant them firmly in this, our native land. Weird, mysterious Ku Klux Klan. For their country’s flag and heritage, they would die before they yield.